Parents around the country have been telling their children to apply sunscreen before going outside for generations, but this repetition doesn’t lessen its importance. When you expose your skin to the sun’s harmful ultraviolet (UV) rays, you develop an increased risk of skin cancer. 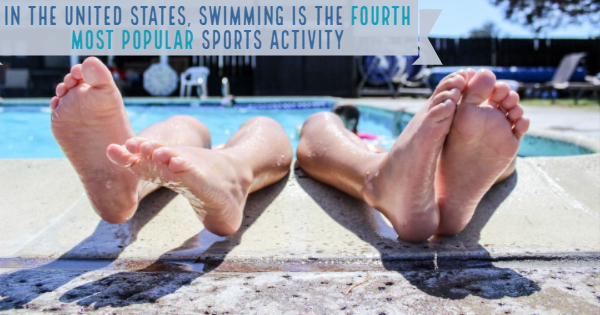 While swimming is a beloved summer pastime and the fourth most popular sports activity in the United States, the reflective nature of the water and concrete or tiled deck surfaces puts your skin at even greater risk. Learn these important strategies for protecting your vulnerable skin from the sun and your entire family can have fun while staying safe this summer. Just as your parents told you, sunscreen is the best defense against the sun’s UV rays. Use a water-resistant, broad spectrum sunscreen that has an SPF of 30 or higher. Apply about one ounce of your protective sunscreen 30 minutes before going outside and reapply every two hours or right after swimming. For reference, one ounce of sunscreen is about equal to the size of a golf ball. Be sure to apply it before you put on your bathing suit to avoid missing spots. Teaching your kids these techniques is important for their skin care as well, as they can use them for the rest of their lives. Another great solution to protect your entire family from the sun’s rays is to invest in pool screens. While the screen mesh material will still let in plenty of sunlight, it will prevent it from directly hitting your skin. Anyone using the pool during the day should still apply sunscreen to ensure that they don’t get a sunburn, but a pool screen will provide constant shade and help keep the pool area cool. Screens for pools are also helpful in keeping out pesky bugs that tend to buzz around the water. If you prefer to spend your time next to the pool rather than inside of it, be sure to not expose too much skin. Wear protective clothing that protects your skin while allowing it to breathe. You should also wear a wide-brimmed hat to protect your head and UV-blocking sunglasses to keep your eyes safe from harmful rays. Those in the pool can still wear swim shirts or rash guards and pick out one-piece suits or long trunks that cover more skin. With the proper protection, you can enjoy the warm summer sun while dodging the dangers of its rays. Take the first step in protecting your entire family by contacting Super Screen™ today to learn more about pool and patio screen mesh. What Kind Of Screen Repair Supplies Do I Need For My Outdoor Screen?